One of the skills that is essential for children with special needs to learn is self advocacy. Once children are able to problem solve for themselves and do not rely on others to notice their need for help they become more independent and feel more empowered. So I'm always looking for ways to embed self-advocacy into our day. The minute my two first graders walked into my room this morning they squealed. "ANTS!!" they yelped, and pointed at the floor which was covered in a long line of ants silently doing their ant-thing of walking with determination in a line. I tried not to show exactly how grossed out and disgusted I was by the infestation while somehow calming the girls down. 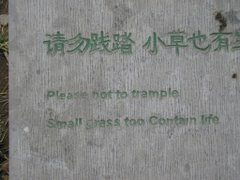 Unfortunately for me, calming down was not something they had any intention of doing. They became so wound up by the ants that I could tell we would get little else done. Plus, the ants were marching right on the edge of our carpet, just begging little eyes to watch them instead of me. So, in the interest of becoming problem solvers and practicing self-advocacy I decided our class would write a letter to asking for someone to come help us with the ants. 30 minutes later my kiddos were very involved in our emergency ants letter and barely noticed that I'd managed to teach the 'ing' chunk, gotten some good phonics work in, reviewed the concept of a letter, and practiced interactive writing and shared reading. Not bad for a spur of the moment lesson with distracted children. They proudly marched the letter up to the office and when asked by one of the secretaries who let the ants into our room replied, "The Queen". Any veteran teacher can tell you that no matter what you do you don't teach the -uck chuck and you don't rhyme anything with duck. It's just too dangerous. Yesterday I'd found a cute book of the song 5 Little Ducks, and was excited that it would fit in with a few of our current objectives. I wasn't even focused on rhyming but threw it in because we can never get too much practice. Patting myself on the back for imbedding rhyming into the lesson I said, "What rhymes on this page?" hoping they would identify play and away. A student sitting in the front row glanced up at the book and clearly said, "duck, f---". My IA and I exchanged looks of panic and amusement as I hurried and loudly redirected the class to the word play. This is the email I sent to our amazing PE and music teachers. Last night they put on dance night for our school, which is always my favorite night of the year. This year, although only one of my students came to the actual dance night, the entire dance unit was utterly amazing for my kids. The last two weeks have been awful for me. Between the large amount of paperwork I've had, disgruntled parents, and early spring-fever behavior I've been wondering why I do this job. Then yesterday during snack my kids starting singing "I've got a feeling". My kids. You know- the ones who need prompts to speak in more than one-two word utterances. The ones who have assistance with accessing PE. The ones that spend PE laying on the floor. Even in their seats at snack they were independently doing the motions you've taught them for the dance, trying to teach me, and singing it loudly as they waved their hands in the air. It was such an awesome opportunity to hear their language skills. So I borrowed someone's iphone so I could play the song during free choice. We played it on repeat- over and over again. My kids were WILD with excitement. They know the dance steps and LOVE the dance. They were singing LOUDLY, laughing, smiling, jumping and dancing. Every single one of them was into it. I took a video- I'll have to show it to you. I just keep rewatching it over and over again because it makes me remember why I love my job. Why all this paperwork is worth it. I am willing to bet that some of these kids barely participated in actual PE/music classes while you were teaching it, but they clearly were still paying attention because they know the words and the movements. Thank you for working so hard at dance night- it's such an amazing opportunity for all of our kids, but particularly mine. Even though most of them didn't come to the actual night they still got so much out of the unit. Your unit gave them language skills, sequencing skills, long-term memory skills, and most importantly, an opportunity to just have fun and enjoy being in school. Thank you for reminding me why I love my job. Happy the Frog did not survive her brush with the air yesterday. This morning we came in to find that she had gone on to a better place. After 5 years of being traumatized and over fed by children in the special education program she is finally in a place where children will not bang on her glass, sneak-feed her, feed her as a reward (every 3-5 minutes), or just forget to feed her for a week on end. She provided us with a lot to talk about, write about and laugh about. Even yesterday we got lots good language out of my children as we discussed 1) how much the tank smelled 2) that it smelled because someone had been sneak-feeding her 3) it smelled so much we wanted to throw up 4) Mrs. Lipstick is really upset that she has to clean the tank again because someone fed the frog too much. She went out as she came in- supporting the needs of the students. Many thanks to our awesome librarian who helped dispose of her this morning while I was panicking and trying not to be sick looking at the dead frog corpse. It is a good thing it is Friday. One of my sweet little ones was having an absolutely horrible day. As hard as she tried to keep it together she just couldn't do it. All of our self-calming strategies weren't working for her and she just couldn't stay in one place. She lashed out, throwing things around the room, attacking books and materials and then would stop and stand back, as though she was horrified by what she'd just done. You could almost see her body shaking with nervous energy and tension. After watching her lunge toward another child's work in an attempt to rip up paper I realized I had two choices- I could fight the pent-up energy inside her or I could look for ways to let it out- on my terms. I found a big bag of old crayons stuffed in the back of one of my cabinets. "Break these" I instructed. "We need small crayons." (Our occupational therapist really had told me that I needed to break all of our crayons into smaller pieces so I wasn't completely pulling this out of thin air). "I need you to help me break these" I repeated calmly and handed her the bulging gallon size ziplock bag. I returned to my reading group and watched her our of the corner of my eye as she sat and broke each one, piece by piece. When she was done I told her I needed them to be even smaller. Throughout the day she'd occasionally leave what she was doing and bounce back over to the crayons to break some more. Her brow furrowed and she tightened her muscles as she broke those big kindergarten-size crayons into tiny pieces. So much energy built up inside her tiny body. Unfortunately because of testing we couldn't go out and let her run around on the playground but we tried to sing and be silly as much as we could in a controlled, safe way to help her get that energy out. 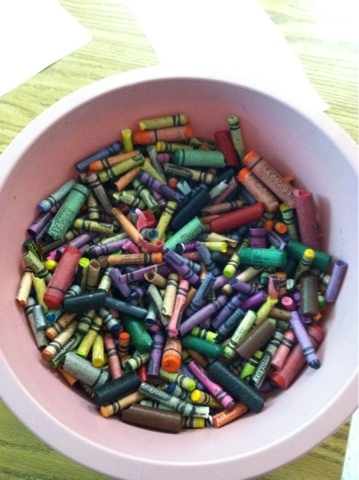 We survived the day and now have a large bucket of small, broken crayons to show for it- just what our fine motor skills require. (She was able to repeat, over and over again that we only break broken crayons if the teacher tells us to). Now I just need to find other acceptable tension-releasing projects that let me control any destruction that could happen in the room. Hmmmm.... maybe we'll do an art project that needs lots of construction paper ripped up into confetti. The day had finally ended. I was leaning into Brown Bear's car, chatting with his family about our upcoming field trip when I heard people behind me yelling something about a frog. I wasn't really paying attention but as I walked back into the building I could clearly hear the words, "frog on the floor". Then someone pointed at me- "your frog." "Your frog is on the floor." My aquatic frog that will die if he is in the air for too long was jumping around our classroom floor. Who knows how long she'd been on land- no one was in my room for the last half hour of the day. Apparently someone walking by the room saw it jumping. Yes, today was just that awful- so awful that the class pet decided to commit suicide. If it wasn't intentional suicide maybe she just decided to break the rules and ignore all boundaries so she could be like everyone else in the room. Hopefully the frog will make it, but she's looking a little sluggish now that she is back in the water. Two weeks ago I loved my job. This week... not so much. I'm not sure what's happened in two weeks that's made me start to reconsider that feeling, but something slipped. Unreasonable parents? Drowning in paper work? Meetings that keep me from seeing the kids? Trying to keep up with larger expectations while trying to still do what is best for the kids? I'm not sure what happened but somewhere in the last two weeks I lost my grove. An arbitrary paperwork deadline has us cramming meetings in right and left, and of course, cramming meetings in means more time away from the kids. This means I'm missing instructional time (panic, panic, we are getting BEHIND!!) and the kids are getting out of their routines. And if there is one thing that keeps things moving in my room it is routines. Brown Bear, Rock Star, Magical and the rest NEED their routines. The kind of brutal that makes me think back to college when I boldly made the decision not to apply to law schools but instead decide to be a teacher. The kind of brutal that makes me ask, 'What was I thinking?' At least if I had gone to law school I would have some respect, from the general public. Is respect that important? Important enough that I should reconsider my career choices over it? I'm starting to realize that it is. When things get bad it helps to know that you are working towards the greater good- you are working on something that others appreciate- you are respected for your hard work and dedication. When things are rough and there is no sense of respect you start to wonder why you are doing what you do. If no one cares, if everyone assumes the worst of your profession, then why are you trying so hard? Of course it's for the kids- the ones with so little who need someone to fight for them. The kids who need someone to believe in them, whose parents need someone to listen to them, whose families need someone to watch out for them. But there are times when even the kids don't seem to be enough to get us through it. Or when the emotional drain of it all just gets to be too much. I have my fingers crossed that in a few days I'll be back to loving my job again. I'll find my groove- hopefully by tomorrow- and be back to realizing that I have the best job in the world. For the past five years I've celebrated my birthday with my birthday buddy- a student I first taught when he was in first grade. Originally we baked a cake together but as the years have gone on it has been easier for me to just bake cupcakes the night before and the two of us find time to ice them together.
. Back then he spent most of his time with his sweat shirt pulled over his head, spoke in only one to two word utterances and rarely smiled. He was painful aware of the differences between him and his friends and as the years went on we felt like we watched him grow more and more inside himself. Last year as we iced our cupcakes he barely talked to me although the IA sitting in the room said she'd never heard him be so talkative. He's now in fifth grade so this was our last chance at a joint birthday celebration. Every time I've run into him this year he's seemed happy yet still a bit shy and reserved. As I was planning this adventure his special education teacher had mentioned that he'd gotten an FM system this week and that it was going really well. That didn't prepare me for the student that walked into my room on Friday. There are various different types of sound field systems used in classrooms. Some, like the one in my class, is set up to amplify the speaker's voice for all the students. It makes the teacher's voice louder than the ambient noise in the classroom and makes it easier for the more distractible children to focus on the speaker instead of on chairs moving, the air conditioning, side conversations, and all the other noises that come with an elementary school classroom (for instance, in my room on Friday someone was yelling "NO KICKING!" over and over as he kicked. There are other types of these systems that are more personal and connect the teacher's voice directly with one individual student. This is the kind my birthday buddy had. I haven't actually seen him with the system so I don't know what he's like when it is in use, but I can tell you that since starting less than a week ago he is more articulate, speaks in louder sentences, seems more confident and in general just seems happier. Even when he wasn't wearing it. I couldn't believe that the kid in my room joking and smiling was the same kid who had been hesitantly volunteering in my room just two weeks earlier. His special ed teacher told me that the minute he put it on and heard his teacher's voice for the first time he lit up. I am amazed at the change in one week and am thrilled that my buddy will go off to middle school with this new found confidence. I hate that it took us this long to figure this out for him. When I taught him in first grade I'd actually just finished presenting at a national conference on using sound-field systems. It wasn't like I didn't know they were out there. Why it never occurred to me to try it on him I don't know. Where would he be if we had tried it earlier? What could he have been doing all this time? He always struck me as smarter than he seemed- his visual skills are impressive and watching him play with blocks always shocked me- he seemed to have a strong understanding of how to piece different blocks together to come up with a solid structure. Yet his auditory memory was extremely weak. He could barely remember anything that was taught to him. Now we know it was most likely because he couldn't hear everything. I don't know the full story on how he came to have an FM system but I am so thankful he has one. Even with all the research I have done and read on these systems I never would have suspected such a profound change within one week of its use. I love that his teachers seem to have unlocked a new child that was hiding inside of him for so many years. "A friend is trying to show all of us in Mrs. Lipstick's class his underwear. Could you give us some pants?" "WET!" the friend yelled happily, pointing to the borrowed pants I'd give him to put on. We've been working on identifying wet and dry to help us know when it is time to change our pants. And yes, he was right, his pants were wet. Of course, they were wet because he'd thrown them into the toilet. He hadn't wanted to put them on but I'd explained that he couldn't put his old pants on because his old pants were wet. So he made his new pants wet too. With old pants and new pants both wet, me covered in urine, and my friend not understanding that he could not leave the bathroom without pants I knew I could either laugh or cry. At least it is Friday and this week is over. Today has been horrible. A perfect storm of disasters. To start with I'd stayed up way too late baking cupcakes for my birthday buddy. I share a birthday with one of my former students. For the past 5 years we have celebrated our birthdays together by decorating cupcakes and since he is now in fifth grade this was our last chance. It has also been an awful week and so I arrived at school this morning tired and stressed. I walked into my friend's room and announced, "We should all go home. I just have a feeling something awful is going to happen today." Moments later I checked my email and learned very sad news about a friend. Now I was tired, stress, sad, worried and distracted. A fabulous combination for a Friday. The day started out OK. We wrote our anger management book for Papa Bear and despite one of my friends recommending that Papa Bear stomp his feet on the toilet seat (????) it went OK. Brown Bear was in anything but a good mood but we were working around it and being flexible. Come time for writing workshop and I pulled out my favorite leprechaun lesson I do every year. It involves reading a story about leprechauns and then planning how to catch a leprechaun. In my mind we would have a very clever class discussion about how to catch a leprechaun, then would draw pictures and write about our plans, and I'd promise to put the plans in place when the children left school. Then over the weekend the leprechaun would visit, destroy the room, and we'd all be in shock and horror that our plan to catch him didn't work. I have done this before. I thought I was prepared for their responses. Shock and horror that I'd want to catch the leprechaun. Those willing to catch him were not able to grasp the concept that we wouldn't be here when we went to catch him. The idea of setting a trap that would work when we were gone was a bit above them. I of course realize this in the middle of the lesson. As I stare out at the blank faces I realize that my very fun and exciting lesson of the day was going south in a hurry and I quickly told them to forget about it and sent them to do normal writing workshop. Perhaps confused from my awesome lesson tanking I managed to forget about a meeting I had over my lunch break. When I finally remembered I ran out of the room in a hurry, leaving the kids and my awesome aid staring at me in confusion, and forgetting to take my lunch with me. I sat through the meeting trying my best to ignore my hungry stomach and my sad, aching for my friend so that I could focus on the important message being conveyed. I also tried to block all thoughts of my aid and what she was going to do to me when I came in crazy late to the class because the meeting was running over. When I returned to the room one of my friends was laying on his back kicking my aid as the other students in my room repeated "no kicking" to themselves over and over again, as though to remind themselves that rules do exist and that maybe if they say it enough it would make the kicking stop. Magical squinched up his eyes and announced that they were tired from seeing all the kicking. The friend having a rough day started flickering the lights on and off. We all sighed. Even our magical-ignoring glasses couldn't block out the screams. Finally the friend having a rough day ended up in the hallway to decompress. He was quiet and reserved out there when one of my coworkers came in, "Um, did you know your friend out there is wet?" And yes, sure enough, he was soaked. So into the bathroom we went. Yet once we were in he decided he didn't want to put on new clothes (they weren't his clothes and nobody wants to wear clothes that are not your own). So he took them off and threw them into the toilet. He was now standing in our classroom bathroom pants-less. The classroom bathroom is a boring place to be and my friend didn't see any reason why he should stay in there now that the pants he was so opposed to were off his body. He attempted to walk straight out of the bathroom into the classroom over and over again. For the most part the other kids were reserved and quiet and respectful of what was going on. Of course they heard me loudly explain, "No underwear in the classroom! We don't show people our underwear"
Check out our 3 bears' house. 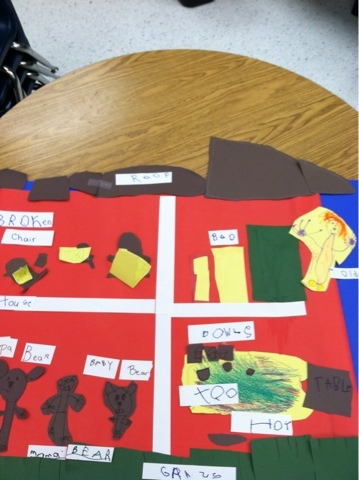 As a part of our unit we made this mural and labeled it using our interactive writing. 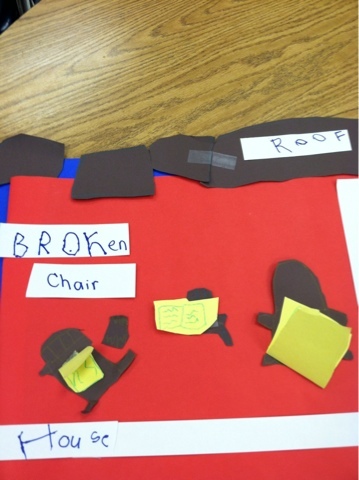 My favorite part of it is the little sound cloud above baby bear's chair to show that it broke- it was made by my friend who recently got hearing aids. Yesterday I was in line behind a few moms discussing whether or not to hold their August/September babies back a year before starting kindergarten. As a kindergarten teacher, and someone with a September baby this is a topic I have an opinion on. However, I quickly learned that there is a breed of mother I have not met yet. At my school I do not come into contact with the moms I met yesterday. The moms at my school love their children but are stressed with working, feeding their kids, managing to live in a small apartment with 3 other families, and citizenship issues. The moms I met yesterday were worried about... I'm not sure what. Worried about some unspeakable, unimaginable thing that may come eat their child if they make the wrong decision. These were moms who dropped their children's PALS scores like they were magic lottery numbers. Moms who clearly felt that this decision was going to give their children the magical boost they needed to get into Ivy League schools. They loved their kids and just want the absolute best for them, and I'm pretty sure if I hang around them enough I'll morph into one of them as well. Yet the whole conversation scared me and left me feeling like I'm just not mom-enough. It's clearly a different world than I live in. I do however have an opinion on when my daughter will start kindergarten, and since this is my personal blog I feel I can share it. It is my opinion for my daughter and not my opinion for all kids. We plan to hold Baby Lipstick back and she'll start kindergarten when she's 6. This could change- she could be brilliant and may be bored with another year of preschool- she could be socially advanced and ready to go to kindergarten- we could get tired of paying for daycare (the most likely scenario). But right now we plan on giving her another year and it has nothing to do with academics, her future PALs scores, SAT scores, or college chances. When I started teaching 9 years ago I was a first grade classroom teacher. When I switched to special education I went down to kindergarten and over the years I've noticed something- what we are teaching in kindergarten is the exact same curriculum we use to teach in first grade. Same lessons, same expectations, one year earlier. I use to watch first graders struggle to count sets of mixed change and now we're expected to ask kindergartners to do it? Play time has shortened, nap time is obsolete, and kindergarten has frankly become the new first grade. It's intense. So for starters I want to give my daughter another year of being a kid. Of playing and pretending and not worrying about counting mixed change and decoding words and writing in the lines. It gives her another year before she hits standardized testing in third grade. I'm not waiting on this to make sure she'll do better on the test a year later- I just don't want her to have to deal with it until she has to. Then there is middle school. I don't want her to be the youngest in a bunch of mean girls. I want her to be with the mean girls when she too is a mean girl. No need to rush into that social pressure when she still wants to play with dolls and everyone else around her is interested in boys. I don't need all her friends driving before she does- she can be the first to get her license- not the last. That way if she's out I know the driving skills of the teenager behind the wheel (if we ever let her learn to drive). When she turns 21 she can be the first so there is no one to binge drink with (silly Mom, there is always someone to binge drink with). Last year partner-in-crime and I had a very old kindergarten class. The majority of the boys had October and November birthdays. 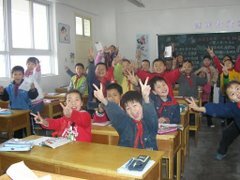 They were calm, and sweet, and silly and ready to learn. It was a kind of maturity we hadn't seen in kindergarten before. They were not overly brilliant or child prodigies but they were mentally ready to handle the first grade concepts we were shoving down their throats. They were ready to sit on the rug for longer periods of time and were ready to socially handle the pressures of this new, demanding kindergarten. I say all this now and I'm sure my opinion will change as we get closer to Baby Lipstick's kindergarten years. If I ever quote her PALs scores or mention her future SAT scores please someone hit me over the head with a brick. I just want her to enjoy childhood- in whatever form that takes. I'd never put too much thought into Goldilocks before other than recognizing the oddness of the blond girl thinking she can get away with breaking and entering. But if you can get past that it's actually an academically packed story. The more I get into my Goldilocks unit the more I realize I can actually milk out of this simple story. So of course I am trying to take every advantage. First of all it's a simple familiar story that is easy for them to retell. It encourages interaction with the text with the repetitive "whose been eating my food?" line and the voices are just fun for the kids to make. The beginning, middle, and end is pretty simple too. Then there is the whole measurement piece of comparing the bears' sizes. Over and over again we are reminded of the size difference, which fits right into our kindergarten measurement unit on lining up objects by size. So we are comparing sizes of bears, bowls, beds, chairs, and then bears again. 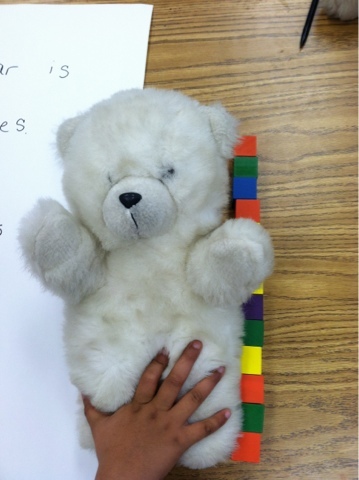 We are measuring with non-standard units so we are using manipulatives to measure stuffed bears and predicting whether momma bear will have more or less blocks than papa bear. Some of my little ones have iep goals to recognize the big object when given two choices- Goldilocks is like the original teacher of big/little. Then we've got a whole unit on opposites. The porridge is hot or cold, the chairs are hard or soft. The bears are big or little. Tall or short. Rhyming is a bit of a stretch but it can be done- bears/chairs. A couple of 3 bears versions I found are written in rhyme so I can throw that in too. Then there is the emotional component. 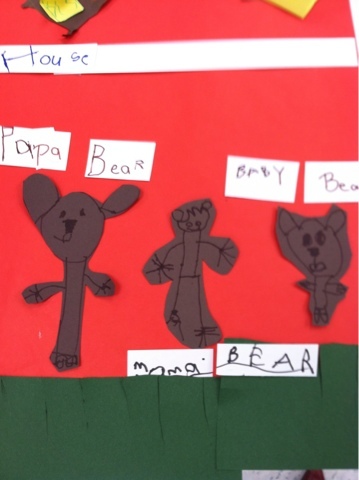 There are the happy walking bears, sad baby bear, angry papa bear, and scared Goldilocks. It's perfect for basic identification of emotions that some of my kids need. -Hmmm Papa Bear's eyes are squinted and his mouth his open. Ever seen Ms Lipstick look like that? Yeah, that is what people look like when they are angry. Now that we've identified the emotional component our next step is going to be to write an anger-management book for Papa Bear. Although yes, Papa Bear may want to be angry enough at Goldilocks to eat her, well, let's see what else he can do. Take deep breaths? Take a break? Ask Goldi to never do that again? Get a drink of water? And then there is the 'don't take things that don't belong to you' lesson. Why is Papa Bear mad? People get mad when we take their things. Let's practice asking first- if Goldi had just asked then maybe they'd all be friends. I'm sure as the unit goes on I'll find more areas where we can milk it for all it's worth. We're making a mural that includes a retelling component, interactive writing, ordering objects from longest to shortest or shortest to longest, and of course just enjoying being artistic. I have a feeling I'm going to be very, very sick of Goldilocks when this is all over. "Mrs Lipstick!" one of my friends screeched when she saw me, "Guess what! I took a BATH! I'm clean!" I've had a sneaking suspicion for awhile about Brown Bear... he's smarter than we're all giving him credit for. He has trouble pronouncing his words, fixates on certain interests obsessively, is non-compliant, and will throw himself on the ground and cry at seemingly nothing. All of this put together can lead one to believe that he has trouble learning new information and is overwhelmed by the world around him. I certainly believed it about him for quite awhile. But lately I've noticed that the more we throw at Brown Bear the better he does. Brown Bear and I "wrote" a book together (I wrote it he sat beside me while I typed and repeated what I said) about Angry Birds. It is our version of Brown Bear, Brown Bear, but instead is Angry Bird, Angry Bird. I figured that we'd use the book to work on concepts of print, reading left to right, pointing to the words, and hopefully, maybe, use it to learn a word wall word or two. The minute I introduced the word wall word 'me' in the book ("I see Angry Bird looking at me") he lit up. He found 'me' everywhere in our room. When I show him the word in isolation he recognizes is. He can make it with magnetic letters. So we learned 'see' and 'you' from the book. Again- he quickly learned these words and took them as his own. He grins when he reads the word to you. He's picking up other words in our classroom as well. His memory is beginning to prove to be quite good. When I gave the class a preassessment on recognizing coins no one could tell me what any of the coins were. I took a deep breath and prepared myself for a long, hard unit. But who seems to be learning and remembering the names of the coins the fastest? Brown Bear. He can't pronounce the names correctly, but he gets "pen" for penny every time, and "dim" for dime. The /qu/' in quarter is rough, but he's making the same sound every time. He is accurate most of the time, and is learning the names faster than his classmates. I continue to be shocked by his memory- it's as though I can introduce something once and if he decides he's interested in it he remembers it. On Friday he was working hard at getting my IA's attention. He was throwing his stuffed angry bird toy around the room and eyeing her, wanting her to reprimand him. He got up and walked toward the door, winding his arm back, preparing to chuck the bird out the door into the hallway. I didn't tell him to get back into the room, or give him any sort of reprimand. All I did was hold up a large cardboard nickel and say, "Hey, Brown Bear, what's this?" His face lit up as he shouted, "NICKEL!!" and he scurried back to the rug. All this time I've been underestimating him. I've been assuming that he was overwhelmed with the language and academics and that was causing his non-compliance, but I think that in reality he's just been bored. We haven't given him enough to learn academically. Although I had this revelation a few days ago today I set up math centers like I usually do- with a group of children working on a kindergarten grade-level activity, but with Brown Bear working at his own station. As he did his work he eyed the kids at the activity. Eventually he got up and wondered over there. I mentally slapped myself on the face- why hadn't I put him there? He could play the game. He knew the coins better than the rest of them. I invited him to play and he quickly fit into the group. I need to keep reminding myself to challenge him appropriately. Since we've increased his academic expectations his behavior has significantly improved. (I realized that now that I've written this tomorrow will probably be very rough). We've all been assuming what he can and can't do based on his atypical behavior and needs. We haven't given him a chance to prove whether or not our assumptions were valid. I love watching him blow past our expectations.